Soften the harshest of sunlight streaming through your windows while adding fabulous to any room with Thyme curtains by LJ Home Fashions. Designed to compliment any contemporary, modern or traditionally styled dicor with ease. Burnouts and a 'painted' leaves. Available in three (3) colors - white/green/red AND white/blue/turquoise AND white/grey/green. Vintage design. Sheer voile fabric. 65% rayonne / 35% polyester. Set includes TWO (2) grommet top curtains. EACH panel is 52 inch W x 95 inch L. 1.6 inch grommet diameter. All dimensions are in inches. Light filtering curtains. Easy to install. Grommets fit standard sized curtain rods. Cold water wash with similar colors. Do not bleach. Hang to dry OR tumble dry on low. Please note, LJ Home Fashions cannot be held responsible for color variations between our products and images viewed on your computer/phone screen. 30 day manufacturer defect only. Jump into today's hottest decor trend with geometric Artemis curtains by LJ Home Fashions. White and grey chevron (geometric) design. Softly woven fabric has the look and feel of linen. 100% polyester. Perfect combination of colour, design and light filtering curtains for your home. Easy to install. Grommets fits standard curtain rods. Set includes TWO (2) grommet top curtains. Each panel is 52x95 inch. 1.6 inch grommet diameter. Cold water wash with similar colours. Hang or tumble dry on low. Frame your windows with a fabulous spring look and Black-Eyed Susie sheers by LJ Home Fashions. Floral embroideries on a white ground. Cross stitch like detailing on sheer voile fabric. 100% polyester. Perfect combination of design and light filtering curtains for your home. Easy to install. Grommets fits standard size curtain rods. Set includes two (2) grommet curtains. Each panel is 52x95 inches. 1.6-in grommet diameter. Cold water wash with similar colours on the delicate cycle. Hang to dry. Add the perfect finishing touch to any décor with Caitlin curtains by LJ Home fashions. A traditional floral design in neutral colors that will compliment any contemporary or traditionally designed decor. Add a spectacular retro look to your windows that will be the envy of all with Daffodil curtains by LJ Home Fashions. 'Filled' botanical floral embroideries inspired from the classic '60's era. Sheer voile fabric. 100% polyester. Perfect combination of colour, design and light filtering curtains for your home. Set includes two (2) grommet curtains. Each panel is 54x95 inches. 1.6-in grommet diameter fits standard size curtain rods. Cold water wash on delicate with similar colours. Hang to dry. Dry cleaning recommended. 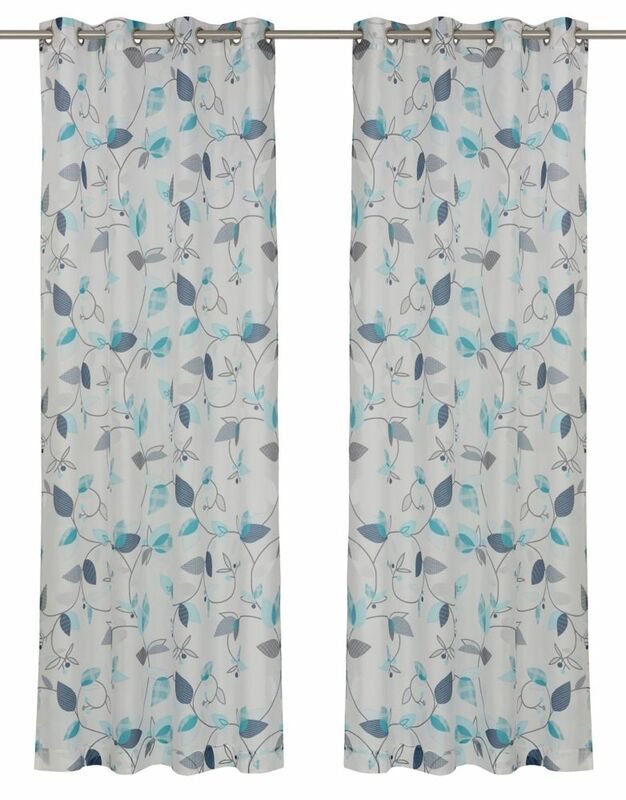 Thyme Sheer Floral Burnout Grommet Curtain Panel Set, 52 inch W x 95 inch L, White/Blue/Turquoise Soften the harshest of sunlight streaming through your windows while adding fabulous to any room with Thyme curtains by LJ Home Fashions. Designed to compliment any contemporary, modern or traditionally styled dicor with ease.